Poster image for "This Neck of the Woods"
The first performance to be staged in UBC Okanagan’s recently remodeled theatre promises to be very different from the kind of performances based on written drama many theatre fans are used to. 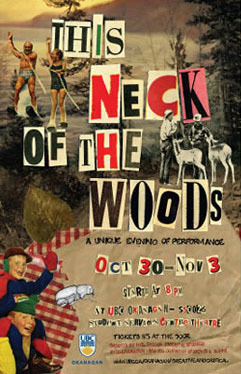 This Neck of the Woods, created by Neil Cadger, Associate Professor of Creative Studies at UBC Okanagan, in collaboration with students and alumni, will take to the stage from Oct. 30 to Nov. 3. "It's not a play. It's a performance and we're still in the process of creating it," Cadger points out. "We’re using a combination of media elements, plenty of projected imagery, live and recorded sound, speech, song, dance -- a broad palette of live-art ingredients." The performance is based on found materials -- text, sound and imagery -- from the immediate local landscape. "It's a kaleidoscopic collage of the world we live in: the natural and man-made environment colliding in a free-market frenzy," says Cadger. "How many square feet of luxury do we really need to feel personally satisfied?" This Neck of the Woods does the math in an evening of wry humour and old home movies. The performance begins at 8 p.m. each evening from Oct. 30 to Nov. 3, in the UBC Okanagan Lecture Theatre SSC026 (Student Services Centre building). Tickets are $5 at the door. An opening night reception will follow the performance on Tuesday October 30.